Who is left to check Trump’s power? Basically no one. 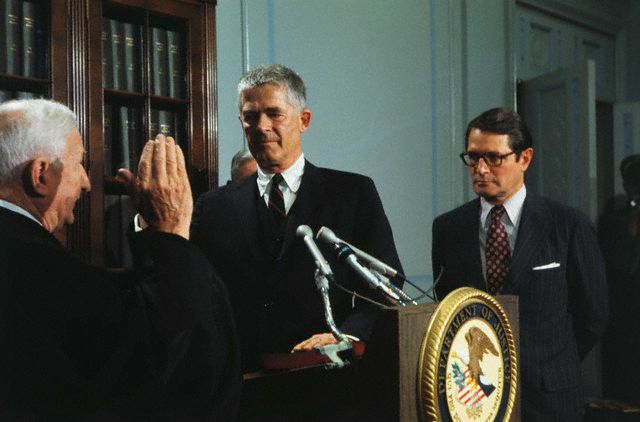 In all of the comparisons to Richard Nixon's Saturday Night Massacre, it should not be missed that both Nixon's Attorney General and Deputy Attorney General resigned when Nixon orders them to fire Archibald Cox, the special prosecutor investigating the Watergate break-in and its cover-up. Nixon finally found his man in the Solicitor General, the execrable Robert Bork, who carried out his boss's orders and fired Cox. In the case do Trump's firing of FBI Director James Comey last night, Attorney General Jeff Sessions would have happily done it, except that he had claimed to recuse himself from the Russia probe after having lied under oath about it. Luckily for Trump, his Deputy AG Rod Rosenstein was up to the task. I point all of this out because it highlights the fact that there is basically no check on Trump's power at this point. The DOJ is in the hands of Sessions, a Trump loyalist. If they even bother to replace Comey—and given Trump's lack of interest in having a functioning government, it would not surprise me if they do not replace him—you can bet they will make their pick based on her/his willingness to shut down and block further investigations of Trump. Congress has mishandled the Russia probe from the start, and is controlled by a Republican Party that has traded away whatever dignity and integrity it had left in order to pass tax cuts and regressive social policy. As for a special prosecutor—for which there has been an increasing clamor over the last twelve hours and which would really be the only hope of an uncompromised investigation—Congress allowed the independent counsel statute of the Ethics In Government Act to expire in 1999. As such, the only person who can appoint a special prosecutor is the Attorney General. It is maybe worth noting that the EIGA was originally passed in 1978 in direct response to the Watergate crisis and specifically, Nixon's firing of Archibald Cox. So—that leaves us with Trump having fired basically everyone who was investigating him and surrounded by toadies and lickspittles eager to carry out his orders. The scuttlebutt out of the White House last night is that the outrage over Comey's firing took them by surprise. I don't buy it. I think they just don't care, because at this point, they don't have to. Trump, who is all about dominance politics and being the Big Man, is increasingly frustrated at his lack of control and is lashing out. This morning's Politico piece spins this narrative, and maybe there is something to it. Trump has something fairly serious to hide, and the investigations are starting to get close to it. And like Marshall, I am extremely worried about the slope down which we are heading here. You should be very worried too. This is not just politics—it’s not just another “They’re all a bunch of crooks” sort of thing. This is Trump, systematically eliminating every check on his power and installing loyalists, and an entirely complicit and compromised Republican Congress that is so far unwilling to do anything about it.